You'd be forgiven for not noticing Chromebooks, cloud-connected laptops that Google promised would revolutionise the way we use our PCs. The idea failed to take off a year ago, and the release of Acer's Chromia AC700 doesn't have much hope of turning the fortunes of the Chromebook. Chromebooks are internet connected laptops, which don't run Windows. They instead use Chrome OS, which is a beefed up version of the similarly named internet browser. There's no storage, and you don't access your hard drive, instead you store all of your data in the cloud, by using services like Dropbox and Google Docs. They're designed to be low cost and low power - not unlike the netbook, which was main event back in 2007. 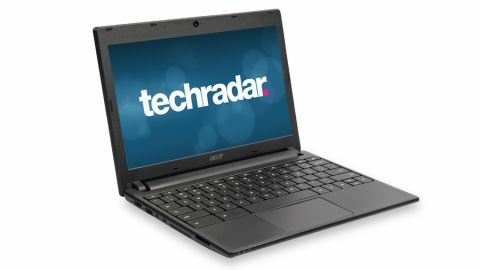 The 11.6-inch Acer AC700 laptop is no different, and emulates early netbooks not only in terms of appearance, style and size but, unfortunately, also in build quality, power and performance. Unlike the relatively stylish debut Chromebook - the Samsung Series 5 - the lack of build quality is apparent from the moment you pull the Chromia AC700 out of the box. It's thick, chunky, plasticky, flimsy and bland. There's no distinguishing decoration, and the black body seems to have been transported in time from laptops of yore. We opened it up and, sadly, things didn't improve. The keyboard is basic, each key feels loosely attached and wobbles disconcertingly when the device is picked up. The track pad is slow to use, feels unresponsive and our clicks sometimes weren't registered. The similarities with netbooks don't end with the exterior. Inside is an Intel Atom processor, the staple low voltage chip found in netbooks. There's also 2GB of RAM and a 16GB SSD drive. There's no need for a Chromebook to have a large hard drive, as nothing is stored locally, apart from system files, and the SSD keeps the operating system feeling spritely. Turn it on and you get your first experience with Chrome OS. The idea is slightly ahead of its time, but we like the idea of a cloud laptop. None of your information is locally stored, so you can be totally flexible. If your laptop is stolen, your data cannot be lost or accessed. The apps are excellent, there's a huge choice of downloads, and Google Docs is now an excellent package. However, the whole idea falls down when you don't have an internet connection. The apps become useless, you can't get your files, and the reality is, we don't live in a perpetually connected utopia. Get on a plane or train and your Chromebook becomes as useful as a chocolate kettle. What's more, we couldn't retrieve files from our own external memory. Chrome OS does support USB sticks and flash storage, but we tried to use multiple storage options, and each one failed to be recognised. This was frustrating, as we had documents that we wanted to upload to the Cloud, but we had to resort to adding them via a different machine, rendering the Chromebook useless. When you are connected, however, the AC700 still doesn't offer the best experience. Yes, it's using a low power Atom processor, but we'd expect web browsing to be smooth - and often it wasn't. We tested the laptop running some high-definition YouTube content, and found the playback to be less than smooth. It was watchable, but still far from perfect. We also found a few bugs, where the Acer AC700 wouldn't run some apps. It asked for us to update Chrome OS, despite no newer versions being available. We hope that this will be ironed out quickly. The screen itself was acceptable for working, but playback found blacks to be, well, grey, and other colours to be dull. The screen also has a glossy Super TFT coating, which seems absurd on an 11.6-inch netbook. The glossy coating is extremely reflective, and makes working outside difficult, limiting use to inside and away from direct sunlight. As you can't run normal third party applications on Google Chrome, we couldn't use our normal benchmarking software, which makes comparing the system with Windows machines more difficult. We looped HD video on the AC700 and got 300 minutes use, which is very good. We'd estimate that to be around four and a half hours of normal use, which stacks up well against smaller devices with tiny batteries. If you're considering a budget laptop, you won't find many less than the AC700, but let's take a moment to consider what else you can buy. The Asus Eee Seashell 1015BX netbook can play HD video, run your apps, works anywhere, looks better, has longer battery life and costs only £230. In short, we can't recommend the Acer Ac700 to anyone, based on price, performance or looks. Gripes around the usefulness of Google Chrome OS - or even its future - aside, this is not the device that will change its fortunes. We expected a great deal more from the Chromebook comeback, and were genuinely excited to see what was produced, and clearly we were to be disappointed. While the operating system for many is well ahead of its time, the Acer AC700 is a step into the past. When there's so much on offer elsewhere, from netbooks to tablets, you don't have to spend any more to buy a better device.